As part of the Imagine2030 campaign we want to show that innovation is not just something for the future. Medical advances being made right now will shape how we fight diseases of poverty in the future, and are delivering changes every day. It will be these advances, and the organisations behind them, that will bring us closer to our goal: an end of diseases of poverty by 2030. As we shift our focus ahead of World Malaria Day on April 25, we’re delighted to be able to showcase the work of people at the frontline of the fight against malaria – where our partners at PATH are working together with community health workers to stop the spread of the disease. “Anyone in the community who feels unwell, who has felt unwell, maybe he’s attacked by a headache, sneezing, fever… they don’t even hesitate, they come directly to me,” Jethro Sianyinyite said proudly. Jethro is a community health worker—CHW for short. 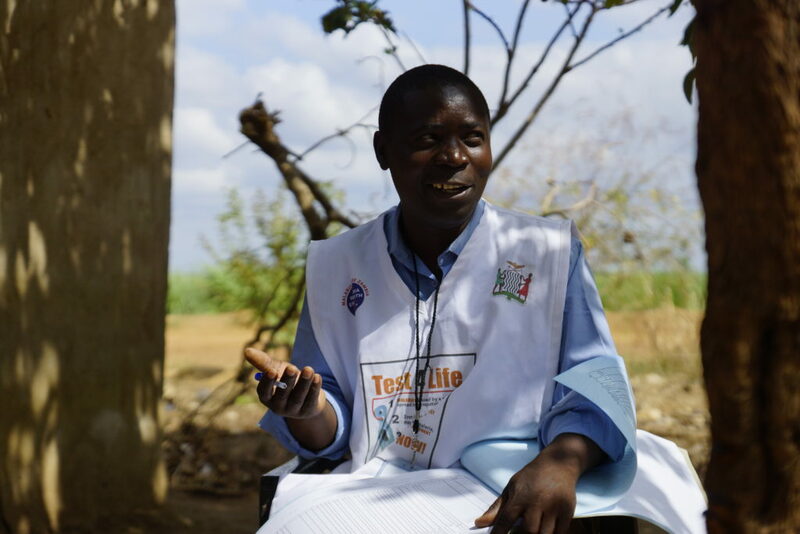 He’s one of more than 2,500 CHWs in Zambia’s Southern Province trained by the Ministry of Health, with support from the PATH Malaria Control and Elimination Partnership in Africa, to diagnose and treat malaria. Today, especially in Southern Province where Jethro works, high incidences of malaria have been reduced to a few “hotspots” and deaths have become rare. Much of the success can be attributed to the dedication of CHWs, volunteers selected by a committee of their neighbors who are trained to educate communities about malaria and to bring free health services directly to people’s homes. It’s a job they take very seriously. “The people were less burdened [by the disease] because these services came nearer to their doorstep. This time I’m seeing great improvement… we have saved a lot of lives for sure,” Jethro said. Community health workers are assigned to designated geographical zones, serving villages that may be 50km or more from the nearest health facility. The CHWs are supervised by health center staff who aggregate their data and send them to the national program for analysis. The data include how many individuals have been tested, how many have been treated, how many of those who tested positive had traveled recently, and so on. The trends that have emerged are remarkable. Since the inception of the CHW program, Sibeso Maseka, who works at a health facility in Mukuni, a village in Southern Province’s Kazungula District, has seen malaria become addressed increasingly at the community level rather than at the health center. “If I talk of my facility in Mukuni, just 20 percent of the cases of malaria are treated at the facility, 80 percent of the cases that the facility records are treated by the community health workers,” Maseka said. “They’re making it possible for us to achieve our mission of making health services as close as possible to the family,” She added that she rarely sees severe cases anymore or records malaria deaths anymore. This chart shows a greater percentage of malaria cases detected by community health workers. Better access to proper diagnosis and treatment supports broader malaria elimination efforts. PATH/Zambia Ministry of Health. A major reason why malaria can now be detected and treated at the community level is because CHWs are properly equipped to do so. The introduction of rapid diagnostic tests (RDTs), handheld devices which can confirm malaria infection in 15 minutes, revolutionized malaria case management, especially in rural areas. 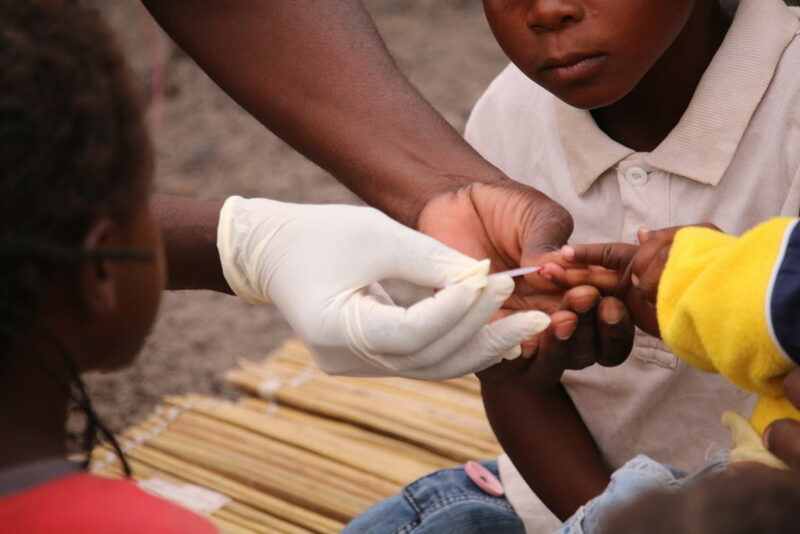 RDTs can even detect low levels of the malaria parasite in a small drop of blood, thereby arming CHWs with the power to find “invisible” malaria cases, where the infected person does not show obvious symptoms. Treating only patients who test positive for malaria has reduced waste of anti-malaria drugs, helping to avoid the development of drug resistance and ensuring that people get treatment for the right disease. There is no silver bullet for malaria elimination. Technological and biomedical advances in diagnostics and treatments and the scale-up of preventive measures such as insecticide-treated mosquito nets and spraying homes have played a role in saving lives from malaria. Learn more about PATH here.